A warm, nutritious meal after busy day need not be complicated nor time consuming. Take this Chunky Chowder for instance. 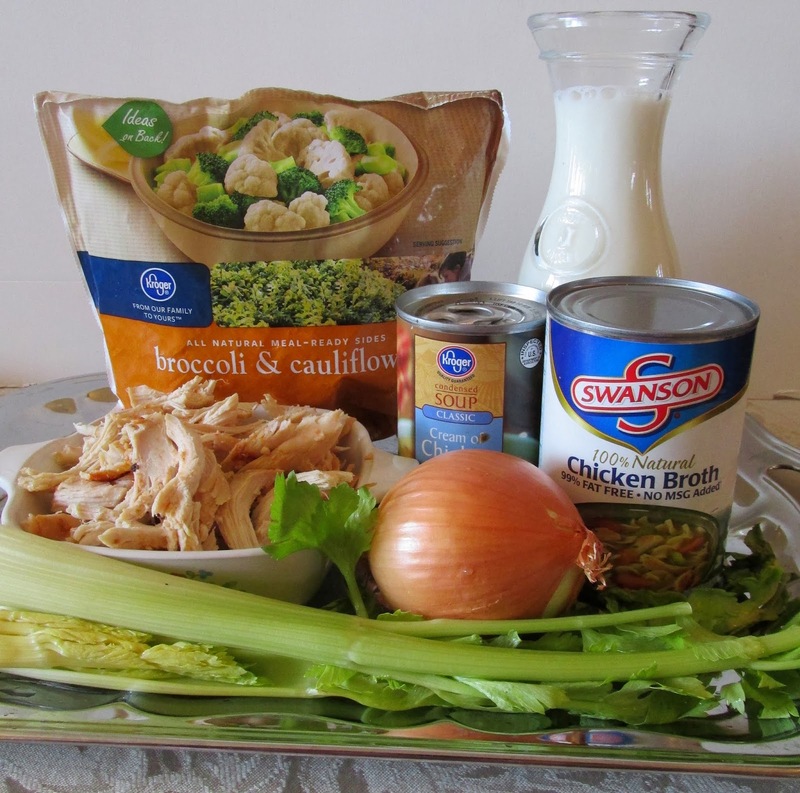 Using leftover deli chicken along with a few staples and some canned ingredients will have you soon slurping some delicious soup! Afterwards why not leave the TV off and play a table game? It is allowed, you know. I think you'll find that your evening seems much longer and it may even lead to some spirited competition or conversation. Our after dinner game as empty nesters has become cribbage, an excellent game for two. In addition to the cool wooden pegboard, it requires a deck of cards. Dominoes is typical Sunday afternoon fare at our house, but it would also be fun in the evening. Both games provide enjoyable light mental calisthenics, perfect for a winter evening. 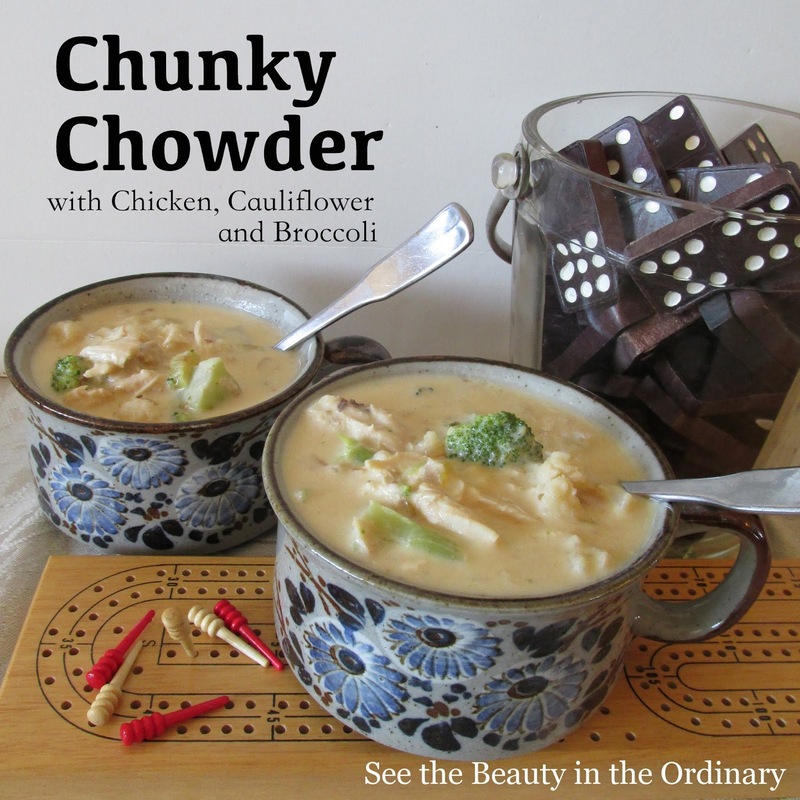 I am trying not to apologize for using canned cream of chicken soup in this recipe. Though I don't use it often, it works very well in this quick soup. This is a very adaptable recipe. I'll offer some suggestions at the end of this post, but if you find yourself rummaging through your refrigerator or pantry thinking Hmm, would this work?-- it very possibly could. Saute celery and onion in vegetable oil in a 2-quart saucepan over medium heat until tender. Add chicken stock and frozen vegetables. Cover and cook until vegetables are cooked, about ten minutes. If vegetables are too large, you may wish to cut them into smaller pieces. Stir in cream of chicken soup, chicken and milk and heat through, stirring occasionally. Cut cheese into chunks and add to soup, stirring until melted. Serve immediately with crackers. These stoneware soup mugs were a wedding gift. Guess which decade? No celery? Leave it out, it will be fine. A potato might be a nice addition. You could add a chopped raw potato to the stock (I'd give it a ten minute head start before adding the frozen vegetables). I often bake potatoes in my microwave for soup. My microwave has a setting for baked potatoes which makes it very easy. Need a simple snack just slightly out of the ordinary? One that can serve a large group? Parmesan Snack Mix might be just what you're looking for! Mix together in a very large container. I used my huge 17X11 baking pan. (You will be baking the mix briefly so why not mix in a baking pan.) You could use two rimmed cookie sheets instead and just distribute the ingredients semi-evenly. Pour butter mixture over dry ingredients and mix gently. 1 ½-2 c. shredded parmesan cheese over mixture and gently mix again. Bake is a 350 degree oven for 10 minutes. Stir once more. Serve immediately or store in sealed container. A 2 1/2 gallon storage bag works perfectly. Makes about 35 servings. I adapted this recipe from one I found on Look What Mom Found. If you are looking for a smaller sized recipe, you may want to check it out. Or halve the recipe above. Next time I make this I think I will include Bugles, those fun bugle shaped snacks, instead of the pita crackers and maybe replace the corn squares with rice squares. This is a very adaptable recipe. I served Parmesan Snack Mix recently when it was my turn to bring treats at work. When you want to serve a crowd something warm and chocolatey delicious there's nothing quite like Hot Chocolate with Pepperminty Marshmallows. Because you serve it from a crockpot, it can be available over a period of hours. You can even walk away from it and there it is welcoming everyone to stop for a moment and enjoy a quick treat. Rich and tasty, it works quite well when its your turn to provide snacks for the staff at work. This recipe serves around 25 (6 oz. serving). In addition to the peppermint candies, I also dipped some in sprinkles. 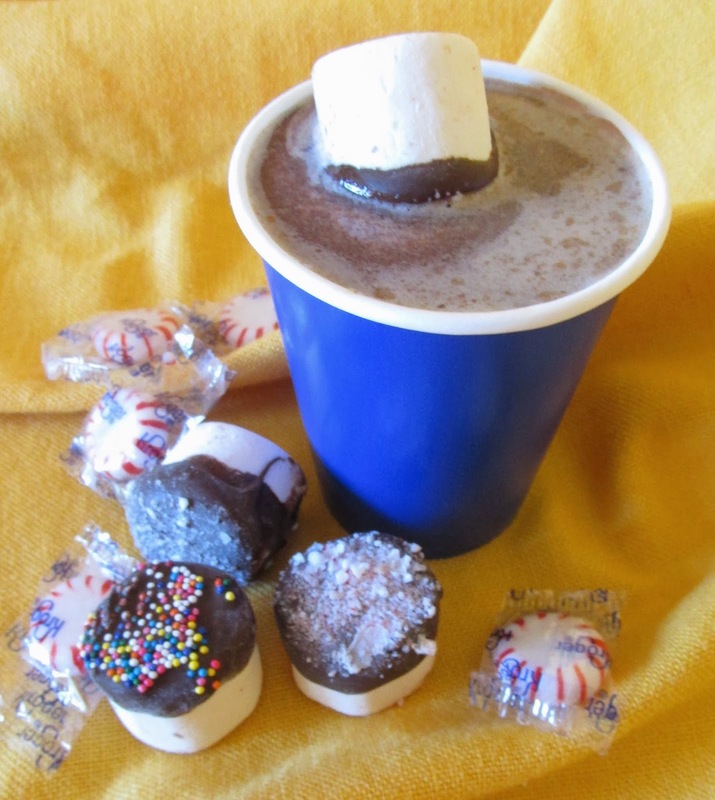 The Pepperminty Marshmallows can be made a day or two in advance if needed and stored in an airtight container. Peppermint candies or canes are coarsely crushed in a food processor. (No food processor? Take a hammer or rolling pin to them!) Simply melt some chocolate bark (6 oz. is enough for 1 bag of marshmallows) in a shallow bowl in the microwave, dip one end in the chocolate and then in the peppermint crumbs. Place on plastic wrap and allow to set up. Store until needed. Stir until chips are melted and everything is combined. For a printable copy of the recipe, please click here. Heat on low until warm. Serve with Pepperminty Marshmallows and enjoy!